Too much Action Girl, not enough Laureline. Sure, Valerian and Laureline is a feminist work, but Laureline has always been about use of flattery, persuasion, and intuition over Valerian's direct and action-packed approach. Feminine strengths over masculine strengths. Brains and beauty over brawn and the beast. Not this sullen stunt girl. I'll cross my fingers and see. That said, the Grumpy Transmuter looks cool. 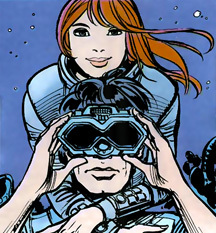 Want to take a look at the Valerian and Laureline comics? I reviewed Ambassador of the Shadows over at Castalia House. While I am not much of a tabletop RPG player, typically scratching that itch with computer and console sRPGs such as Final Fantasy: Tactics and the Disgaea series, I've been keeping a closer eye on the RPG scene since the literary analysis coming from gamers is often more insightful than from the literary crowd. Players who want to play Conan-style adventures need GMs who know how to tell Conan-style stories. Autarch, LLC's most recent Kickstarter for their Adventurer Conqueror King (ACKS) game boasts the following gems on pulp and genre. What do we mean by “heroic fantasy flavor”? It’s the flavor that J.R.R. Tolkien and Robert E. Howard have in common, once you remove what’s different. Tolkien and Howard are usually considered opposites – high fantasy versus swords & sorcery, British versus American, literary versus pulp, and so on. But if they are opposites, they are opposite faces of the same coin, and that coin is heroic fantasy. Their worlds have more in common with each other, and with those of luminaries such as E.R. Burroughs, Clark Ashton Smith, H.P. Lovecraft, and Michael Moorcock, than with any of their contemporary epigones. Heroic fantasy is set in a world like our own world, one that might even be our world, in its distant past or far future. Its heroes, though men and women of extraordinary talent and drive, have none of the “super-powers” now common in contemporary fantasy (especially games). They do not typically teleport, fly, shoot fire, or raise the dead. Magic in heroic fantasy is more subtle and nuanced than in contemporary fantasy. It works with what is, rather than creating what is not. A magician cannot teleport straight to his friend’s distant castle, though his whispered dreams might reach his friend across the black gulfs of space. A magician will not fling magic missiles, but he might call down lightning from a storm, or capsize a boat with a wave. Working magic might require lengthy ceremonies, terrible sacrifices, or the power of primeval places. And those who use magic risk corruption. Even the wisest can lose their mind, body, and soul if they tamper with dark magic. That’s heroic fantasy. While the Heroic Fantasy Handbook explores the classic heroic fantasy genre, Barbarian Conquerors of Kanahu embraces what might be called “barbarian fantasy” or perhaps “pulp fantasy.” Barbarian fantasy is an amalgam of three distinct but related genres. The first is sword & sorcery literature, exemplified by the likes of Howard's Conan and Moorcock's Elric. This genre counterpoises corrupt, decaying cities and empires with rough-edged barbarian upstarts. It contrasts the decadence of urban life with the vigor of those untainted by it. This might have been inspired by the fall of decadent Rome to the Germanic "barbarians"who set themselves as kings of its ruins, or even by Samson's divine-inspired exploits against the urbanized Philistines. The second is sword & planet, exemplified by Edgar Rice Burroughs' Barsoom, a fantastic vision of Mars. This genre explores similar themes to those of sword & sorcery but does accept certain "science fiction" elements such as alien planets, radium pistols, flying craft, and other technological wonders. Sword & planet still follows the vision of a morally-ambiguous 'outsider' protagonist, archetypically an earthling on Mars, using his might to smash the decadent villainy of the local society. The third is science fantasy proper. This book, however, presents a "science fiction" milieu closer to a fantastic setting once the outer trappings of starships and rayguns are stripped off it. This genre is exemplified by space princesses, dashing interstellar rogues, space combat which looks suspiciously similar to WWII air combat, and a relative disregard of actual science when it conflicts with the plot. The same tropes of the barbarian fantasy genre also apply here: it is easy to envision the mighty lost-world barbarian smashing through the ranks of raygun-wielding aliens with his massive sword, answering their advanced technology with his brute strength. This is allegedly the song behind Manly Wade Wellman's "Vandy, Vandy", but as David Drake says, "Certainly Manly was quite angry at Hoyt Axton for ‘getting it wrong’." While there is some confusion if Manly Wade Wellman wrote the song himself, or if the song comes from the Civil War era, here is a link to the lyrics as attributed to Wellman. Axton's version uses slightly different lyrics. Sales figures. Campbell vs. Pulp in the 1940s. To be fair, though, Astounding was selling about as well as Weird Tales in its prime. But to see Amazing sell nearly as well as Doc Savage and the Shadow in their prime at a time where pulp was "dying" is, well, amazing. "But Shaverism, whatever and by whoever, was only one of Palmer’s inventions. Brought in by Ziff-Davis in the early l940s as a wild-eyed fan who Ziff-Davis thought (after the death of T. O’Connor Sloane at something like the age of 167) could find a formula which would appeal to all the other wild-eyed fans who Palmer in voluminous correspondence to Amazing had claimed to represent, Palmer published a magazine filled with—there is no other way to put this—dreadful fiction by dreadful writers (with a few good writers encouraged to write dreadful fiction; good writers can certainly do this). Author Earnings recently released their statistics for 2016 book sales. As industry hands and book reading fans poured over the results, one of the more interesting facts is that science fiction sold the least of all the major categories. This is not a surprise to those who have been following the shrinking sales of the Big Five in this category, although it is still unwelcome. Unfortunately, the worst is yet to come. A survey of modern science fiction shows a repeated pattern of extinction events. In the 1950s, the pulps died. At the end of the Crazy Years of the 1970s, magazines died as the primary medium of science fiction and backlists died. The 1990s and early 2000s killed off the midlist writer. And, as the same old song plays of magazine sales drying up, rumors of publisher woes, and publisher wisdom telling authors that science fiction cannot sell, we stand on the verge of the next great crash for the genre. That this crash is happening in the 2020s and not in the 2010s is due to the 1990s' publish woes lasting into the 2000s, pushing back the date of the upcoming crash. ...proscribed writing about “interesting” characters–such as famous historical figures or creatures of myth. He decried exotic settings–places such as Rome or Pompeii, and he denounced tales that told of uncommon events. He praised stories that dealt with the everyday, where “nobody murders or debauches anybody else; there is no arson or pillage of any sort; there is no ghost, or a ravening beast, or a hair-breadth escape, or a shipwreck, or a monster of self-sacrifice, or a lady five thousand years old in the course of the whole story.” He denounced tales with sexual innuendo. He said that instead he wanted to publish stories about the plight of the “common man,” just living an ordinary existence. While the writing in this new pulp was palatable, the major problem was that The Shadow no longer existed in it. Instead, Lamont Cranston became the hero, solving mysteries with the police. All hints of a secret identity were ignored. The Shadow lost all his superhuman qualities. His guns remained holstered, his laugh rarely pealed across the pages. Removed were the cast of supporting characters and the villains. The agents and the gadgets. 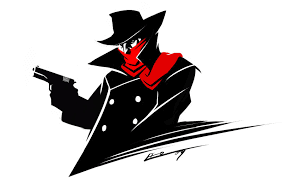 The Shadow's laugh and his blazing 45's. Under her direction away from the fantastic and exotic elements that were essential to making the Shadow, "the magazine fell back to bimonthly and then to quarterly as sales continued to fall." This is the reason that science fiction as a publishing category nearly died off in the 1990s. Things have improved a lot in this century, but that doesn’t help the perception that the writers who toiled in the successful, but less accepted, subgenres didn’t exist at all. I mention the literary part of the genre because it held its strongest sway in the short fiction categories. It’s easier to maintain a magazine with literary pretentions than it is to maintain a book line with the same attitudes. A lot of sf book lines died in the late 1990s and early 2000s. Some magazines, including the one that I used to edit, lost a vast amount of readership when those literary attitudes I just mentioned took over at the turn of this century. The current plunge coincides with the uptick of realism brought in by intersectional politics, which seeks to impose a narrower grade of realism on the genre, as instead of a common man, these writers explore the plights of specific and numerically smaller minorities. What might start as the examination of the plight of the common man gets pushed aside for the common woman who gets pushed aside for the common Hispanic woman who in turn gets pushed aside for an even smaller minority subset. 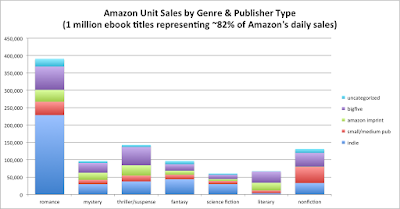 And the sales continue to fall, and publishing continues to writhe with the changes caused by ebooks. The worst yet to come. On the other hand, some of the sf magazines grew in circulation. For example, Asimov’s Science Fiction grew in overall circulation after Sheila Williams became editor. She got rid of a lot of the slipstream fiction (the stuff you couldn’t tell from realistic fiction) and purchased a lot of space opera and adventure fiction. Embrace the fantastic and the exotic. Embrace adventure. These are the key to sales in science fiction, and the shelter from the upcoming storm, just as they brought science fiction out of its previous crashes. Don't make the same mistake that drove hundreds of writers out of the field. Avoid realism. Join Three for Three today, and post three reviews for your favorite authors today.